So you’ve got a good grasp of your ukulele, but have wondered what it’s like to play the Big Daddy of ukuleles? – a Baritone ukulele. A baritone ukulele is tuned D G B E in it’s standard tuning. It is also normally a linear tuning, i.e. the D string is the lowest string, not as in the Soprano/Concert/Tenor uke a re-entrant tuning, where the G string of G C E A stringing is a high note. If you, like me you play guitar, the tuning of a baritone ukulele offers no fears. Strings 1 to 4 of a guitar are D G B E, then on top of that you add two bass strings A and E to give E A D G B E bass to treble. Hence baritone chords are very similar to guitar chords, just missing the 2 bass strings. If you place a capo on the 5th fret of a baritone ukulele, the open strings are G C E A, in other words the tuning for a soprano/concert/tenor uke. This means that the chord shapes for the baritone are same as other ukes, it’s just the chord they sound is different. If you count on your fingers from thumb to ring finger, from A you get D (ignore sharps/flats). From thumb to little finger, brings you to E or the fifth chord. The tone of a baritone ukulele is much lower and mellower, which it makes it very good for playing ballads on, especially if you finger pick. I find the baritone very good for finger picking. On my baritone I have replaced the two bass strings which were metal wound with nylon strings, which are much nicer on the fingers and give the whole instrument a uniform feel. If you play with other ukulele players, the addition of a baritone uke in the mix adds a lot of warmth to the overall sound. Something else that might come as a relief to some, is that certain chords are much easier to play on baritone, than other ukes. Of course the reverse applies as well. The dreaded E chord for example is the same shape as the easy A chord on a soprano/concert/tenor. I’ve done a couple of comparisons between a concert and baritone uke in the video, to give you and idea of sound comparison. Why not give it a try – it’s a challenge. 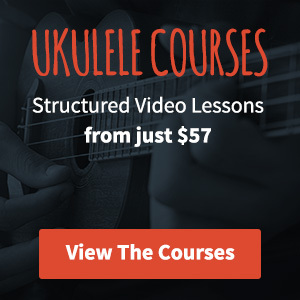 Hi Amy, your baritone will naturally give you a different tone to the soprano ukuleles in a group so you could simply play the same chords to accompany. You could also try some simple picking patterns. That should get you started. I read with much interest the following which you wrote earlier……. What strings did you use for the wound strings on D and G ? Also, I’m looking for Dean Lewis songs on the bari since I really like his music, but I can’t find any anywhere, does anyone know of any sites that could help, like chord conversions?